Type A (analyst): Focused on static data analysis. More of a statistician or a scientist with coding skills than an engineer. Type B (builder): Focused on building data products. More of an engineer with a strong statistical or scientific background than a scientist. With advanced degrees in areas such as physics, computational chemistry, and mathematics, most of my colleagues at Automattic initially leaned more toward Type A than B. In contrast, I’m a classic Type B, having worked as a software engineer before doing a PhD and becoming a data scientist. While this is an extreme example, it is a good demonstration of the knowledge gaps of new Type A data scientists. Causey lists five engineering skills that data scientists should acquire to start bridging those gaps, but he notes that his list isn’t comprehensive. This is partly because there is no single definition of best practices, and many of them can be seen as obvious or implicit. Nonetheless, since joining Automattic last year, I’ve dedicated some of my time to help increase awareness and adoption of engineering best practices in our data science projects. The rest of this post describes some of the results of this work. Started using the pre-commit Python package to check our code locally before it gets committed. The checkers that we use are pycodestyle, pydocstyle, and Pylint. The former two enforce compliance with some of the guidelines from PEP8 and PEP257 (the official Python style guides for code and documentation, respectively), while the latter detects potential programming errors and ensures adherence to a wide range of coding standards. Set up CircleCI to run the above checkers whenever a pull request is made or code is merged to the master branch. This ensures that even if pre-commit hooks were skipped for some reason (e.g., misconfiguration), errors would be caught. In addition, CircleCI uses pytest to run our tests in an isolated Conda environment that is similar to the environment in which the code is expected to run (e.g., a sandbox that connects to our Hadoop cluster). Increased clarity around code placement by setting up a central data science repository for all our shared code, one-time analyses, notebooks, and various experiments. The only projects that have their own repositories are those that get developed and deployed as standalone tools (e.g., a2f2 – our time series analysis tool). To make it easier to share code across projects, we converted our collection of reusable scripts to a private Conda package. Originally, code was sometimes copied to different projects, violating the DRY (don’t repeat yourself) principle. In other cases, the shared code was just assumed to be at a specific local path, which made it hard to reproduce results if the shared code changed in ways that broke the dependent project. With our versioned Conda package, different projects can rely on different package versions, making long-term maintenance easier. We chose Conda rather than pip because it allows us to manage the binary dependencies of our projects without making special requests to our system administrators. While our projects handle diverse datasets and address various customer needs, they often end up following similar patterns. For example, all projects accept some data as input, process it, and produce an output (e.g., predictions). Different data scientists working in isolation tend to come up with different directory structures, file names, and identifiers to represent similar concepts. To reduce this divergence and make it easier for us to switch between projects, we have started working towards a standard project structure, inspired by the Cookiecutter Data Science template. However, we found that the suggested template doesn’t fully match our needs, so we are in the process of adapting it, and may share the results in the future. Serves as a sanity check to verify that requirements make sense. Allows folks to find bugs through both manual testing and in code. Lets all folks involved learn new things! Can also serve as documentation for how something worked, and why certain decisions were made. Perhaps even for a future you! In addition to improving the quality of our projects, code reviews and our other efforts in adopting best practices address the main problem identified in Trey Causey’s article — that “many new data scientists don’t know how to effectively collaborate.” As with all things that we do, we are committed to never stop learning, and strive to further improve our processes. As noted above, initiatives like our standard project structure still require more work. In addition, we would love to share more of our data science code with the open source community. This is likely to happen as we further improve the modularity of our projects, making it possible to publish generally-useful libraries. Watch this space! 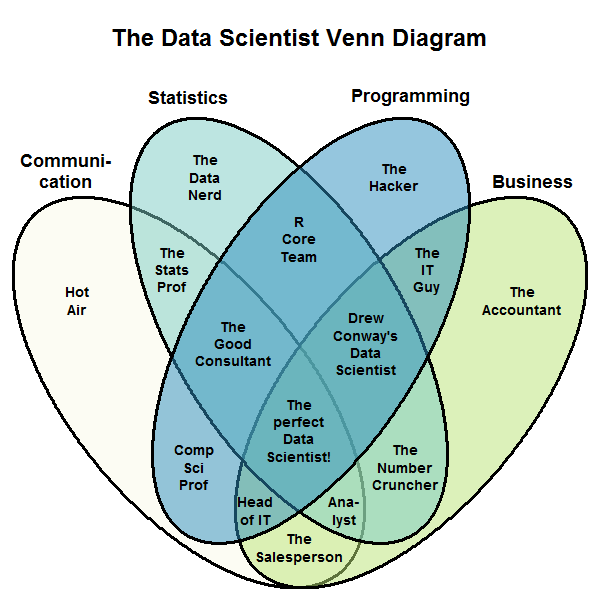 Data Scientist? Data Engineer? Analyst? My teammate, Yanir Seroussi writes about bridging the gaps between the different professions. Many useful gleanings from my colleague Yanir Seroussi — he has a plan to keep the interest on your A.I. technical debt real low. If there ever were to be a handbook on collaboration on data science, this would be one of the first commits! Reblogged this on Robert Elliott. I take exception to the “hot air” part. Soft skills are just as scientific. We read a different kind of data: it’s human data. Behavior. We analyze body language, inflection, tone. We decipher patterns and predict behavior in real time in order to adjust the conversation for affinity. Whether online or in person affinity is key. Affinity leads to loyalty. Loyalty leads to sales. Of course data is important, but it’s good to be reminded that data is a look at the past, not in the moment. Thanks for commenting, Bridget. I did not create the Venn diagram, nor do I endorse it or its labels. It is used as a counterexample for classifying data science in an over-exclusive way. Fair enough, but that is what stopped me reading. Using it is an endorsement. Seriously? Communication is labeled as Hot Air? Please help me understand how collaboration is achieved without using active listening skills and artfully phrased questions that propel curiosity. My understanding is data science fuels transformation of perspective. I believe the label “Hot Air” is dismissive, derogatory, and falls short of embracing the union you prize. Thank you Kathy. Please see the clarification above.